Challenge: Completely automate the client and job-tracking responsibilities of a leading IT Consultancy. Allow staff to maintain mobile time-sheets with Palm application and create new job tickets with RIM pagers. 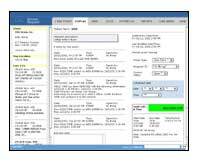 Solution: Job tracking system designed to track all work done for clients by ticket number. Integrated with email to allow clients to receive status updates. Address book with map location integrated into system. Document Management function integrated into application as well which allows staff to electronically file documents and notes pertaining to their clients. Two interfaces were designed to allow quick access for internal staff and clients.  Function which allows assigned task specific to logged in user to show at start screen.  Weekly Calendar allows view of all scheduled jobs.  Time reports which allow administrator to see logged hours by time or by client and month.  Time keeping for jobs with Palm organizer and auto-sync back to database. Challenge: Completely redesign website for a major insurance company. Architect new information structure. Create templates and web-ready graphics from final designs. Solution: Led team of developers and worked with design and production teams to identify usability, information architecture, navigation design and functionality issues. Worked with Art Director in creating style guides, wireframes and page template standard for site. Also developed complex graphical layouts. Developed friendly navigation which allowed site visitors to better find their information. Challenge: Completely redesign website for a major publishing company. Produce page templates and graphics. Lead team of developers to produce final product. Solution: Worked with Art Director and Lead Designers to build final pages and designs which adhered to design guides. Managed cross platform testing. Documented design and development standards as well as wire diagrams. Accmplished goal of "flattening" the previous sites navigation and worked with designers to allow more use of MH's subsidiary brands and convey a more energetic look and feel for site content. Challenge: Produce a completely new way for the headquarters of a global non-profit foundation to automate their work flow and keep up with all the demands of a rapidly growing staff. Solution: Create a dynamically driven intranet site. Make key uses of Cold Fusion and its rapid deployment capabilities. Developed several web applications to provide: a Trouble-Ticket System and Ordering System for the MIS department, Conference Room Reservation System for all of our staff to use as well as many other applications that allowed for easier management of complex tasks. Challenge: Construct another channel of information for the television viewers of "Out of Ireland" which would provide more knowledge about the show to viewers and possible advertisers alike. Another requirement was to also allow viewers to share ideas and provide feedback to the show and its producers. Solution: Developed a high-energy site with a moving "news flash" applet on the home page, permitting visitors to quickly see what was on the shows next edition. Produced a very simple to use Cold Fusion enabled guestbook (with its own administrative tool) to allow visitors to leave their comments and to also allow the site administrator control which comments will be viewable to other visitors. Provided brief highlights from past shows using Real Video clips. Challenge: Establish an independent film companys first presence on the internet. Provide information to attract distributors for their films and possible funding for their current and future projects. Assemble all the information on their films into a navigable structure for a site. Solution: Press reviews, photography and film summaries for their films were produced in addition to brief Quicktime movie highlights from each of their films. Closely worked with the film companys directors to establish color schemes for the website that best reflected each individual film and the film company itself. Challenge: Create an online version of the Center on Crime for Communities & Cultures Domestic Violence community organization directory. Carry over same look and feel of print version while making some improvements allowed by the digital format. Solution: Many of the same graphics from the print version were used but with more use of color and soft tones. Made careful use of frames (in web browser) to allow quick access and searches of specific parts of the publication. Challenge: Provide an online (database driven) edition of all the centers listings for community organizations, which provide help to victims of domestic violence. Solution: Created a new Cold Fusion enabled database in MS Access with a web-based administrative tool to allow adding & deleting entries. Prepared a search screen visitors to the site would use, which would allow look ups by name, state or an alphabetical index. Challenge: Fully makeover the programs web site. Organize all content into easily navigable categories. Create a more pleasing look and appearance. Solution: Designed animations, simple graphics and photos to display along side programs information. Used Cold Fusion scripting to make the sites table of contents page into a collapsible viewer (inside a frame) for all the sites various documents. ** view local mirrors if a live site is unavailable. *** Live version available by request.